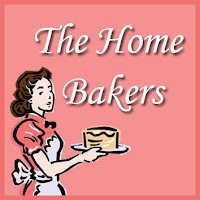 For the full recipe, please visit Emily’s site as she’s the host for this bake. 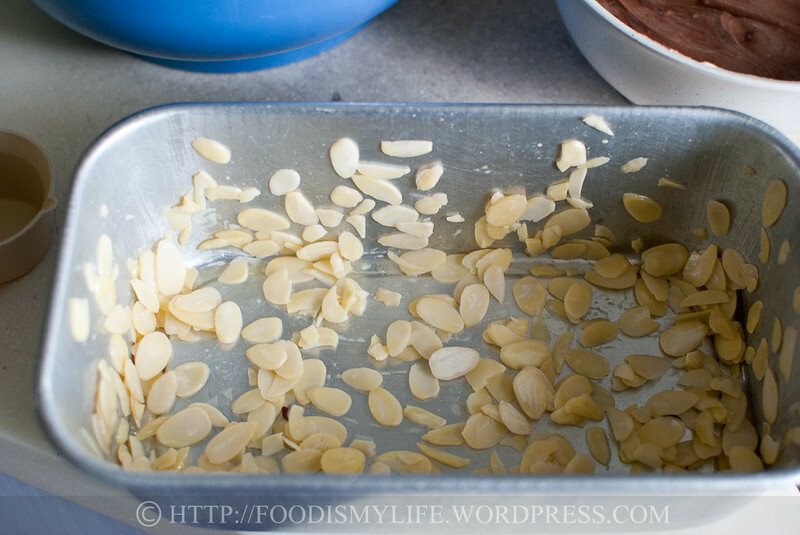 First coat 28 grams (1 oz; 1/2 cup) of sliced almonds in a well-buttered 8 x 4 inch baking tray. I used 2/3 of the amount to coat the bottom and the sides, the remaining 1/3 goes on top of the cake. 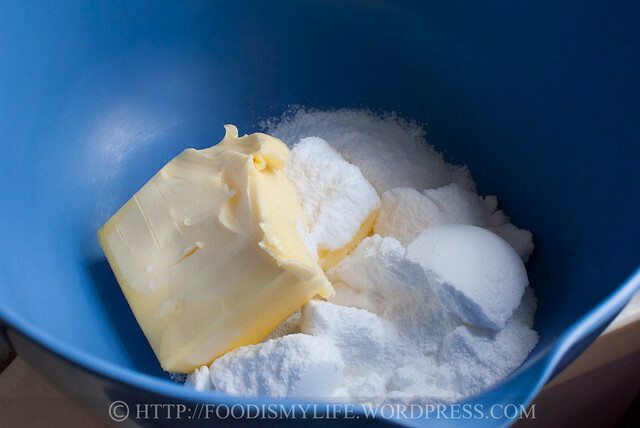 Cream 170 grams (3/4 cup; 1.5 sticks) unsalted butter and 155 grams (1 1/4 cups) of icing sugar with an electric mixer. Beat in 3 eggs, one at a time, scraping the sides after each addition. Beat in 1 teaspoon of vanilla extract. 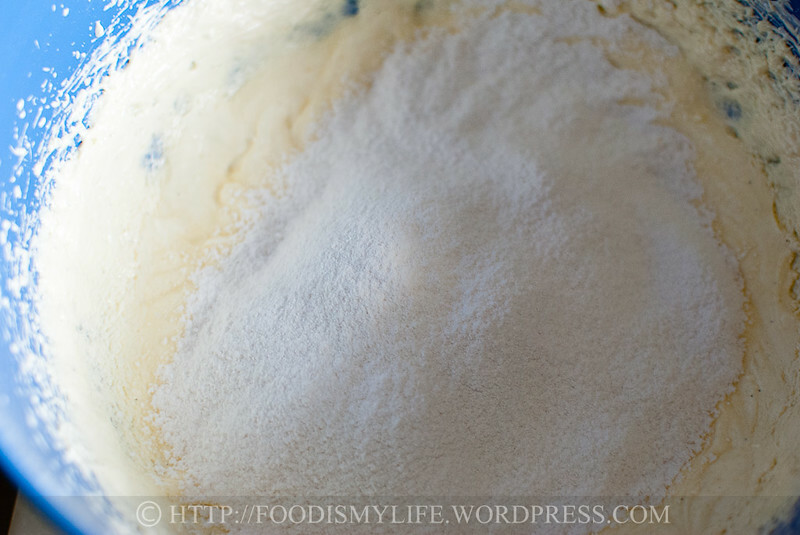 Fold in 140 grams (1 1/8 cups) plain flour, 30 grams (1/4 cup) corn flour and 1/4 teaspoon of salt. 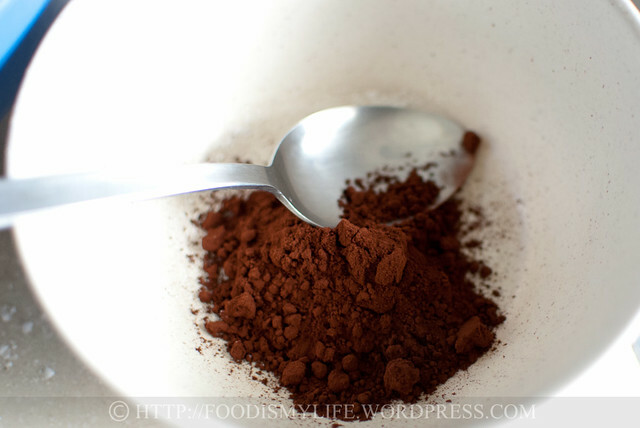 Or simply use 170 grams (1 3/8 cups) cake flour and 1/4 teaspoon of salt. … and dissolve in a little hot water. 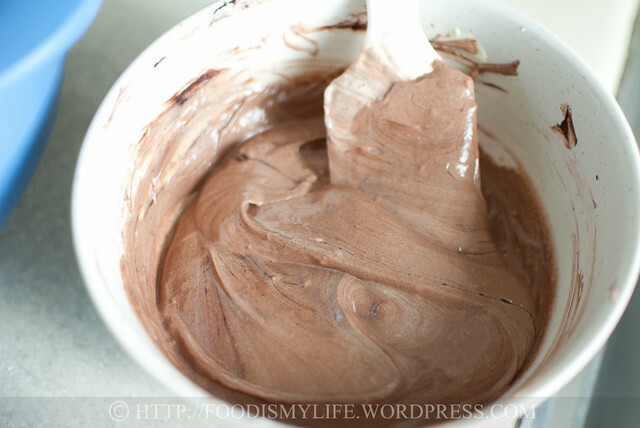 Add 1/3 of the batter into the chocolate bowl and mix thoroughly. 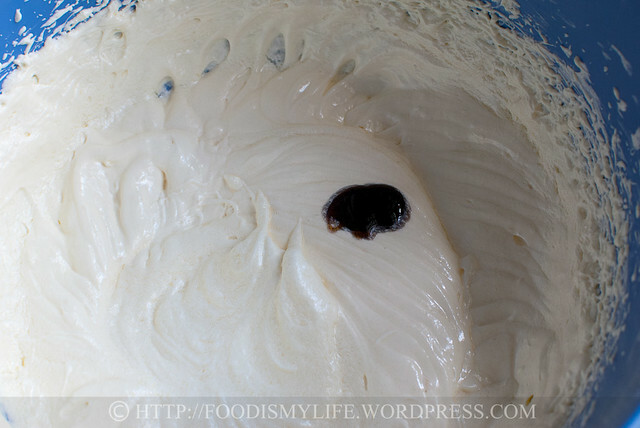 Drop dollops of batter into the tin. Smooth the top of the batter. 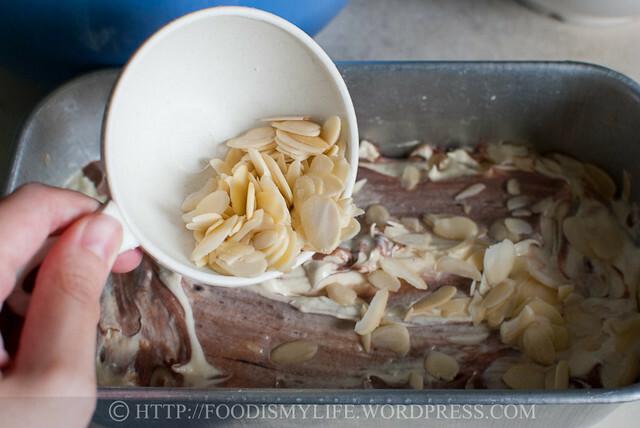 Sprinkle more almonds on top! Bake 30 – 40 minutes at 150 degrees Celsius till golden brown and a skewer inserted into the centre comes out clean! 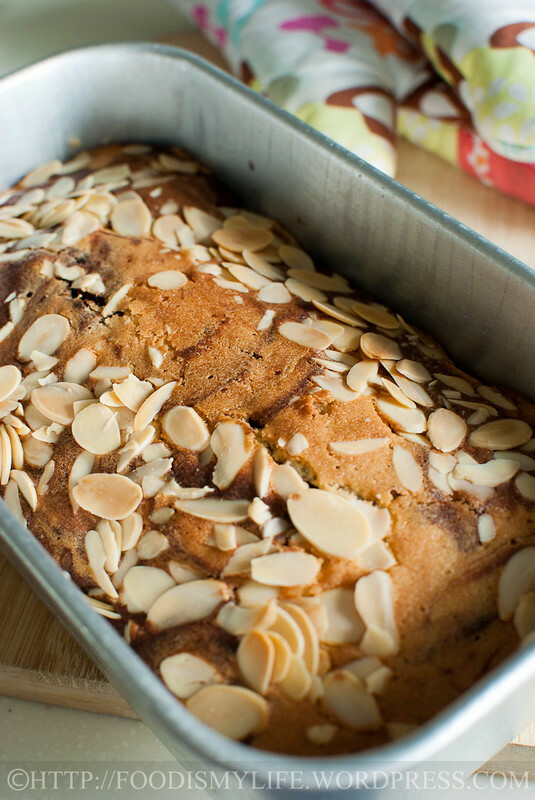 For the full recipe, please visit Emily’s site as she’s the host for this bake! 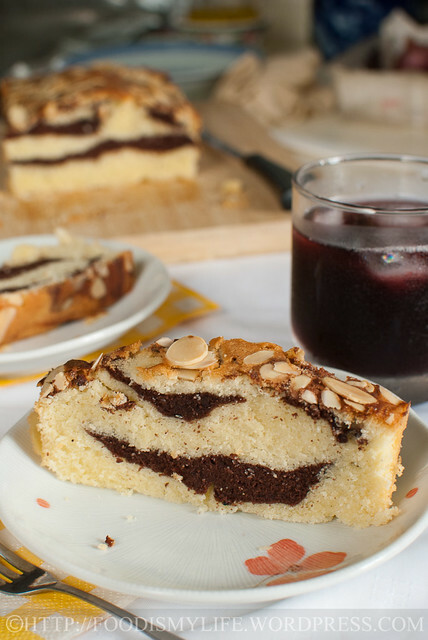 Jasline, this is really pretty cake u baked, so smart to twist to marbled cake, and look at the generous almond slices…yum! Jaslin, you got a nice layer of chocolate. Thank you Lena! Yea it’s a bit frustrating because the almonds won’t stick! Haha, it’s a great cake, I really love the fine crumb, just that it’s not soft and fluffy enough for me! Thank you for the compliments Janine! I hope yours will be fluffy! 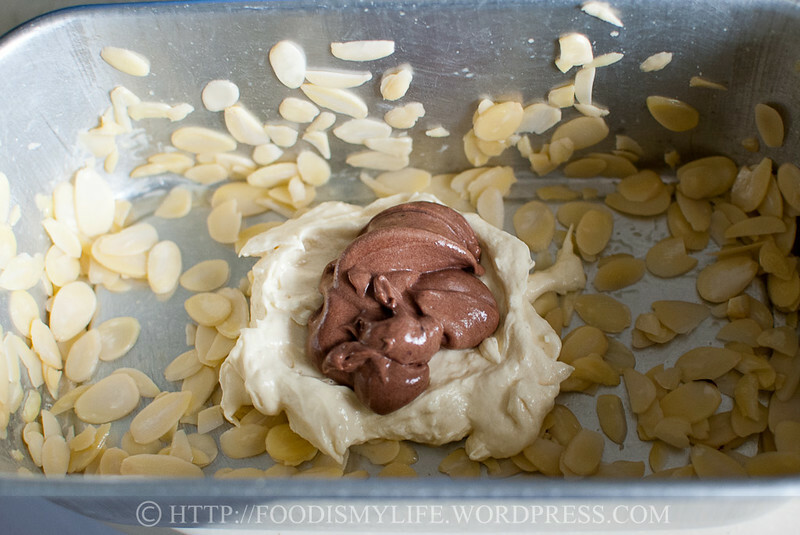 I want to try baking this again with baking powder, but can’t find the time to do so yet! Thank you for the compliments! Hahah that’s a glass of grape juice I’ve got there 😉 I was drinking grape juice when I was prepping for the shot, so I decided to use it :p I’m sure it’d be perfect with milk, tea, and coffee! Thank you for the compliments! 🙂 I only wished that the cake is softer and fluffier! you made them look so gorgeous, also with the added cocoa effect. Yes,there was a little work sticking the almonds onto the pan, had to stick them one by one and some got dropped and hv to stick it back again! haha! Neverthelss , it was not too bad overall. 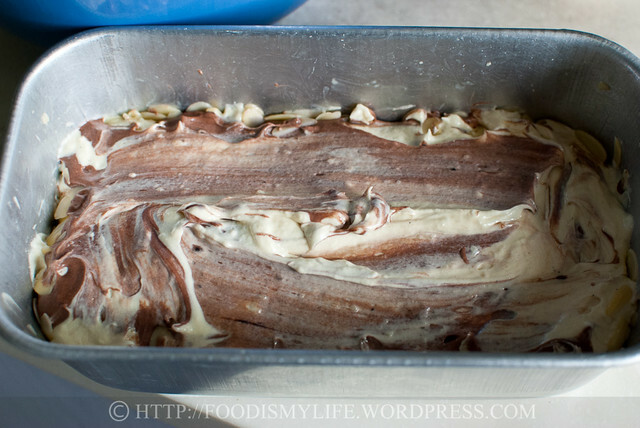 Excellent looking marble cake. Yours look soft and I like this texture. love the process photos too! and your comment on the texture of the cake is pretty helpful – i’m thinking of trying this recipe after seeing so many people try it but i think i’ll add a pinch of baking powder and see if it gets the fluffy texture that i like too! I LOVE your process photos. Yum! I like butter cake without other flavors added to it. Your cake looks very inviting though. Love the marble effect! and I like the generous use of almond flakes. 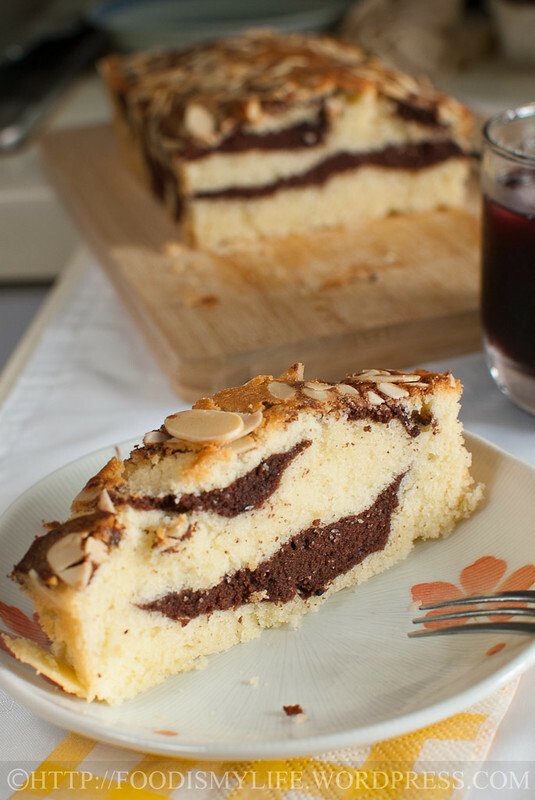 What a delicious marble cake 🙂 and I LOVE your photos. 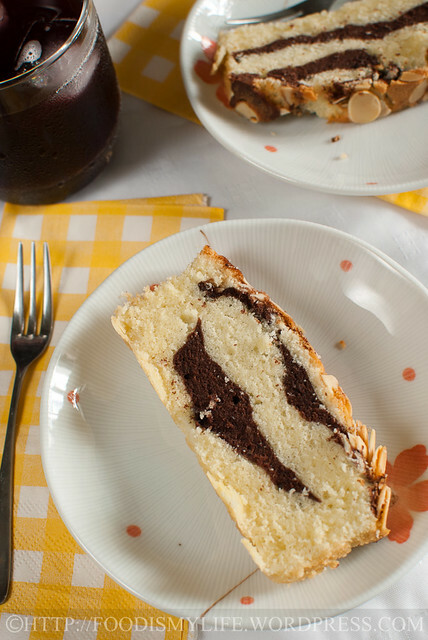 Adding chocolate strips in your cake does make the cake more interesting! Like what you said, I don’t think this is my favourite butter cake recipe too. A great idea with the marbling! This cake does have a fine texture! I should try marbling it the next time too! 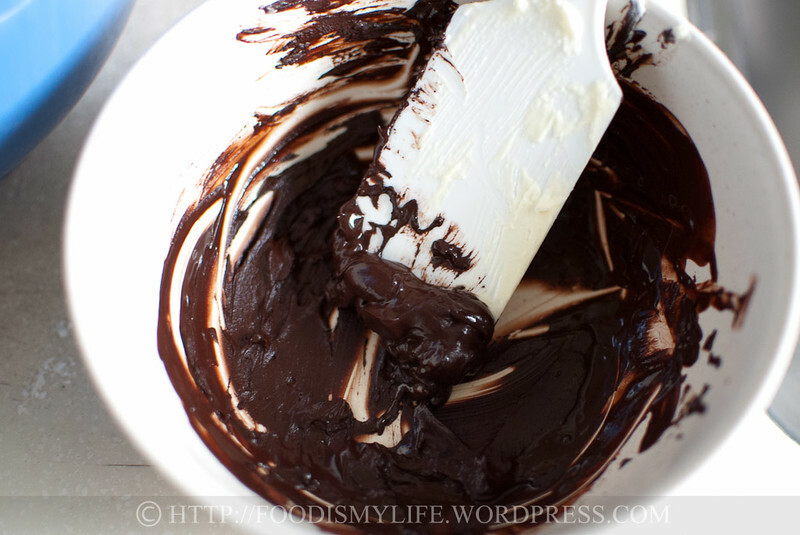 Jasline, what a wonderful idea to layer in some chocolate… makes it even more delicious! Oh my, this looks really delicious! This sure does look good! It’s that final photo of the single serving on a plate. I want! 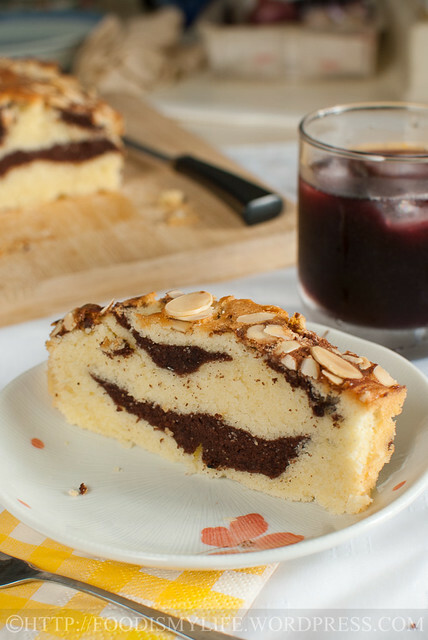 Such an attractive two toned cake and the sliced almonds on the top of the loaf make me want to dive in with a fork, forget slicing it. 🙂 The slice on your plate would be a cookbook example to tempt someone to make it though I would have a large glass of cold milk to drink it down with not the cola(?) one that’s next to it. Looks wonderful, I love the gooey chocolate, the cake looks tender and moist. Very nice!